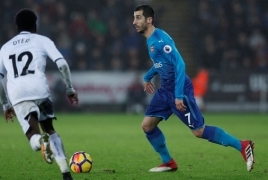 PanARMENIAN.Net - Arsenal midfielder and captain of the Armenian national team Henrikh Mkhitaryan has seen his value decrease from £31.5 million last season to £27 million now, according to Transfermarkt.com data. His highest market value ever was £33.30 million when he still played for Manchester United. Mkhitaryan's contract with the Gunners expires in June 2021. He joined the club from United in a swap deal which saw former Arsenal player Alexis Sánchez go the other way round. The Armenian was recently sidelined for several weeks after he suffered a metatarsal bone injury in a match against the Spurs. But he is very much expected to feature against Huddersfield Saturday, February 9. Wrestler Karen Aslanyan has won bronze the European Wrestling Championships in Romania’s capital Bucharest. Boss Unai Emery believes Mkhitaryan’s salary could be better spent elsewhere as he bids to reshape his squad. Armenian athletes have won two medals at the FIG Gymnastics World Cup, currently underway in Doha, Qatar. Armenian PM slams Turkish President's remarks as "hate speech" Nikol Pashinyan has slammed Turkish President Recep Tayyip Erdogan's remarks about the Armenian Genocide as hate speech. New cancer test treats patients with precision The medical team are able to extract huge amounts of information from tiny fragments of human DNA. Syria demands withdrawal of British, U.S., Turkish and French troops "All political issues should be tackled by Syrians without outside interference," Mahmoud al-Shawa stressed. Sturgeon wants Scottish independence referendum by 2021 The first minister told Holyrood that she would introduce legislation soon to set the rules for another vote.